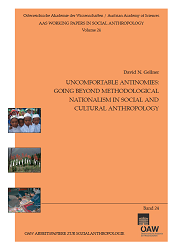 This chapter considers some of the ways in which social and cultural anthropology has changed since its heyday in the immediate post-World War Two period.1 In particular, it focuses on the challenges to anthropological fi eldwork methodology, with its stress on long-term stays in specifi c places, arising from the increasing mobility of people, ideas, and things – the process normally labeled globalisation. Just as practice theorists have argued for an irresolvable antinomy between structure and agency both sides of which must be embraced (Ortner 1990), I argue here that anthropologists must learn to live with uncomfortable but necessary antinomies (in the Kantian sense) between their face-to-face methods and the global issues they wish to address, and between their commitment to holism (with its associated dangers of methodological nationalism and/or ethnic groupism) on the one side, and the necessity of encompassing within their purview fl ux, movement, and change, on the other. Whether anthropologists couch their response to globalisation in terms of multi-sited ethnography (a methodological stance), global ethnography (a research programme), or in some other way, these antinomies cannot be avoided and should be embraced. Ethnographic exemplars are taken largely from the Asian contexts with which I am most familiar, but I hope that nothing advanced here depends on the particular cases considered.